Jacques Ellul was a 20th century French philosopher. He wrote several books, and some were about technological and its impact on society. Perhaps the most important of these was “The Technological Society” (see recommended reading list). Ted Kaczynski (also known as “The Unabomber”) often quotes from Ellul, and even though this might be considered a poor choice of reference, I do believe it highlights the fact that Ellul’s work has far-reaching implications and influence. The following You Tube video is a short 6 part documentary produced by Jan van Boeckel. “The Betrayal by Technology” is a fascinating view into the thoughts of Ellul made before some time before his death in 1994. It is all in French, but does have English subtitles. Please watch the entire documentrary at this link and feel free to leave comments. I think Ellul makes so many interesting points, it is sure to stimulate discussion on many levels. Wikipedia: Technology deals with human as well as other animal species’ usage and knowledge of tools and crafts, and how it affects a species’ ability to control and adapt to its natural environment. From this viewpoint, following Frances Stewart, we shall make the important distinction between the available technology and the actual technology in use. Thus, starting with a broad definition of technology as extending to all the ‘skills, knowledge and procedures for making, using and doing useful things’, we may describe technology as a set of techniques, each technique being associated with a set of characteristics. Technology is interpreted as an anthropological constant to construct an environment in which man can survive. Acting in the field of technology is to act rationally with a purpose, i.e., in the framework of a means-end relation, and it is employed for coping with “experiences” (Widerfahrnisse) by means of using tools. In the forward by Robert Merton: defines technique as, “any complex of standardized means for attaining a predetermined result” (p. vi). 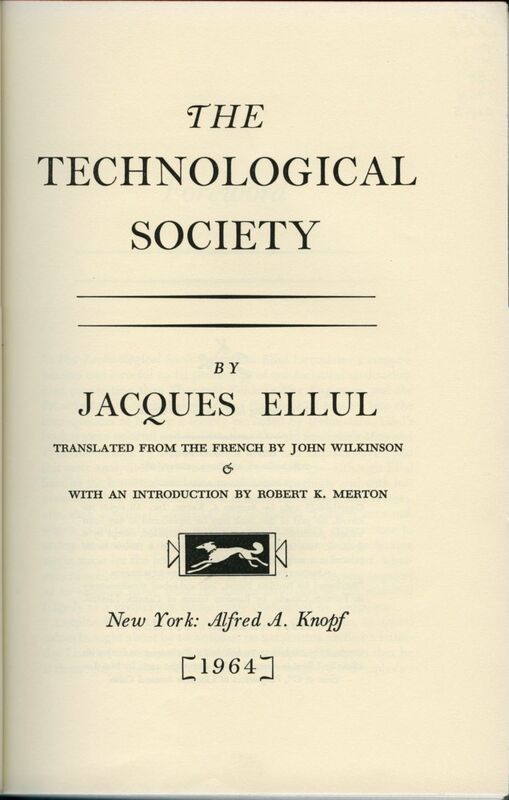 Jacques Ellul himself defines technique as: “the totality of methods rationally arrived at and having absolute efficiency in every field of human activity” (p. xxv). Theorist H. D. Lasswell’s definition of technique as, “the ensemble of practices by which one uses available resources to achieve certain valued ends” (p. 18). My personal definition: Technology in general can take many forms both concrete and abstract. However, it is born by the intentional actions of Sentient Beings (Human for the most part in this time frame) to change the environment in a way that is both unnatural (by definition) and more efficient. Once created, technology can persist in either abstract form as an idea or methodology (generally referred to as techniques) or be instantiated as a physical object which may (or may not) require further utilization by a sentient being to have an affect upon the environment.